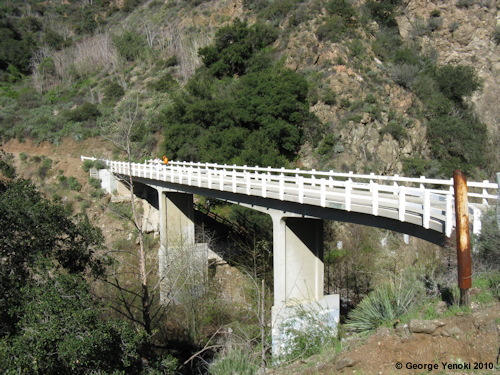 This bridge across the Eaton Canyon wash is located on the Mount Wilson Toll Road, 1.1 miles north of the Nature Center. There are two primary ways to get to the bridge: hike there from the parking lot by crossing the wash and proceeding uphill along the access road, or park at the Pinecrest gate and walk down the steep road inside the fence. To get to the Pinecrest gate, go north on Altadena Drive one mile past the entrance to Eaton Canyon. Turn right on Crescent, then right again on Pinecrest. Observe parking signs carefully. From the bridge you can hike south to the Nature Center (1.1 miles), or up the Toll Road to Henninger Flats (2.7 miles) or Mount Wilson (8.7 miles).